To view this video, visit https://www.youtube.com/watch?v=MxNLfmHrI5E. Every message fits in somewhere. Something came before it, and something will come after it. In fact, messages are meant to change the world in some way. 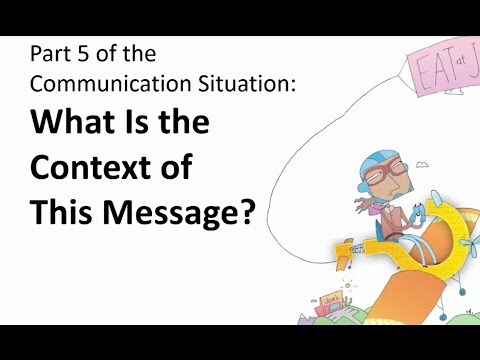 Watch this video to learn about the context of any message. Your Turn Analyze the context. Think of a message that you are currently studying. It could be the "Declaration of Independence." It could be the book Alice in Wonderland. It could be Dr. Martin Luther King Jr.'s "I Have a Dream" speech. Choose a message and answer the questions below to think about its context. When and where was this message originally received? What happened just before this message was received? What happened after the message was received? When and where did you first receive this message? How different were things when you received it than when it was originally received? How did this message affect the world then and now? Thinking About the Context of a Message by Thoughtful Learning is licensed under a Creative Commons Attribution-NonCommercial-ShareAlike 4.0 International License. Based on a work at k12.thoughtfullearning.com/minilesson/thinking-about-context-message.